Last week Allen at Eating Out Loud featured a recipe for Sigara Boregi with Minced Meat. As I read the recipe I realized that it sounded a lot like the phyllo rolls that I used to get at La Mediterranee in San Francisco. They were always a favorite of mine so I knew I had to try my hand at making them. La Mediterranee served the rolls with a choice of three fillings, beef, chicken or cheese. My favorites were always the beef & chicken rolls both flavored with cinnamon. The beef is left savory while the chicken is sweetened with golden raisins & powdered sugar. I thought Allen's recipe for the beef sounded spot on so that left me to play with the chicken. These were so good! I love the flavor of the cinnamon with the meat. Matt & I both really liked the chicken with the sweetness from the raisins & the powdered sugar. It was like being back in San Francisco & eating at La Mediterranee again. I don't usually cook with phyllo because I think its fussy but once I got the technique down (& ripped the first two rolls) these came together really easily. Heat the oil in a skillet over medium-high heat. Add the onions and cook until beginning to soften. Add the garlic & pine nuts & cook another 2 - 3 minutes. Remove from the heat & allow to cool. Stir all remaining ingredients together with the onion mixture. 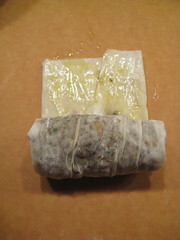 Since both the beef & chicken filling start with the sautéed onions, garlic & pinenuts, I made that then split it in half. That way I was able to make a half batch of the chicken filling & a half batch of the beef filling. Lightly brush one half of the dough with the egg mixture. 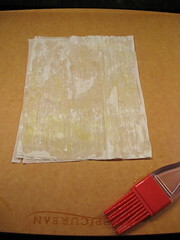 Fold the dry side over the wet. Put 1/4 cup of filling in the middle of the dough leaving about 2 inches on each side. Fold the top long sides over the filling. Fold the bottom up & begin rolling filling up like a cigarette. 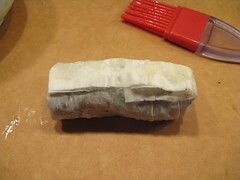 Brush the top 2 inches with egg mixture & finish the roll. 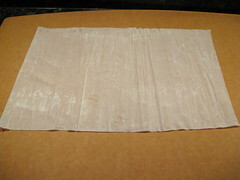 Place on a baking sheet with the seam side down. Brush the rolls on the tops & sides with the egg mixture. 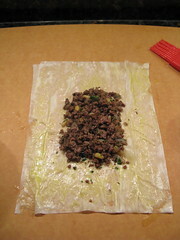 Sprinkle the beef rolls with sesame seeds. Bake at 350 F for 20 - 25 minutes until the rolls are golden brown. 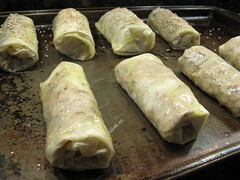 Sprinkle the chicken rolls with powdered sugar (Don't skip the powdered sugar, it really makes these rolls) before serving. These remind me of a Moroccan pastilla! I love stuffed cabbage w/ rice, meat and raisins. Your phyllo bundles are beautiful. 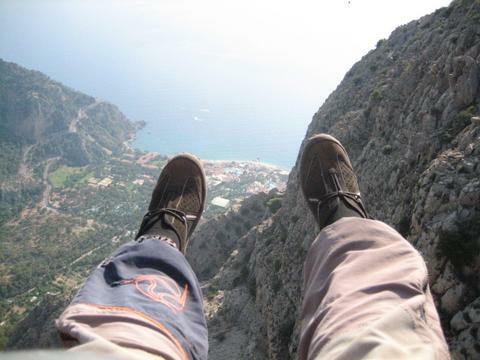 Very daring for a Monday night! These are really interesting. I hadn't really seen these before with more than just a cheese filling. Yum! ANd I love the step by step photos - makes is easier for people like me to figure it out!! 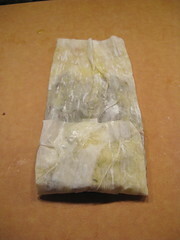 I have a roll of phyllo dough in the freezer that I need to use- and now I know exactly what to make with it! This is genius! 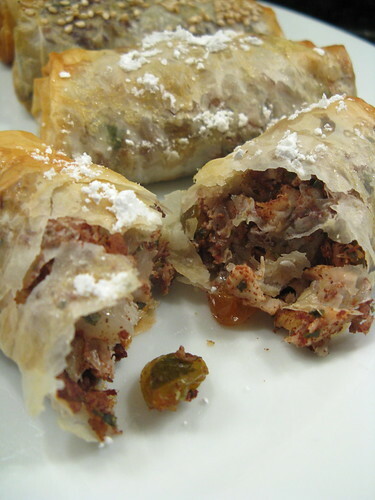 I never thought of using phyllo like this! Greeks throw cinnamon into savory dishes, so I know what this tastes like. You also handled the phyllo very well. I've been eyeing Allen's Turkish delights too, so I'm happy to hear that this turned out well. I love the fact that they're baked. Hm, now I want something exotic tonight. Those look really amazing, wow! Yum! I love how you flavored the chicken filling with golden raisins and am intrigued by topping with powdered sugar. I'll have to keep this in mind to try next time. Im loving the sound of these, the pine nuts especially! Oh cool. I would never have thought of this. I'm always thinking about cheeses or spinach inside of phyllo. I haven't eaten at La Mediteranee in 16 years but I will never forget those chicken rolls. 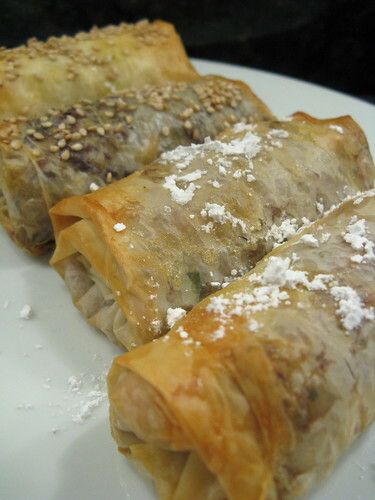 I just came across a mention of the restaurant today and it got me thinking about those rolls and I did a search for "chicken raisin phyllo sugar" and found your lovely recipe. I definitely will be making this to bring back the nice memories of that wonderful restaurant. I've been to La Mediterranee around 100 times. I'm not kidding. I lived in the Lower Haight for 15 years and was aregular at L.M. I'm doing this as an app for a Christmas get together and doing a trial run right now. As my wife and I are vegetarians I've tweaked a few things on the filling while trying to keep true to the recipe. The rolls are in the oven and looking good. Thanks SO much for this recipe!! I graduated from Cal last year and have a great love for the chicken cilicia from le med =) I've been craving this since moving back to LA! I was looking for a way to use up a little leftover phyllo... I just made up a half batch, and they were delicious. And yes, the powdered sugar is a must--they taste just like La Med! THANK YOU for posting this! Like so many other folks, I'm a Cal grad and the flavor of these at Lad Mediterranee has never left me. It's probably my favorite dish at my favorite restaurant in the bay area. I've searched for years for something similar, but never found anything, so I'm DYING to try out your recipe! As L. Miller said earlier, the La Med recipe had chick peas/garbanzo beans also, but those should be easy enough to add.